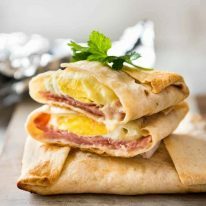 These irresistible Ham, Egg and Cheese Pockets are soft on top and crispy on the bottom, they take 3 minutes to assemble and you won’t dirty a single thing. I mean it! NO DIRTY DISHES! I noticed the other day that McDonald’s have Ham and Cheese Pockets as part of their breakfast menu! I haven’t tried them, and doubt I ever will, but these look just like the McDonald’s one – with the added bonus of egg. 🙂 Extra tastiness, and keeps you full for longer! Doesn’t the inside look fabulous?? And I love the crispy edges! This is how to assemble it. Firstly pile on some ham, then create a “well” using shredded cheese and crack in an egg. 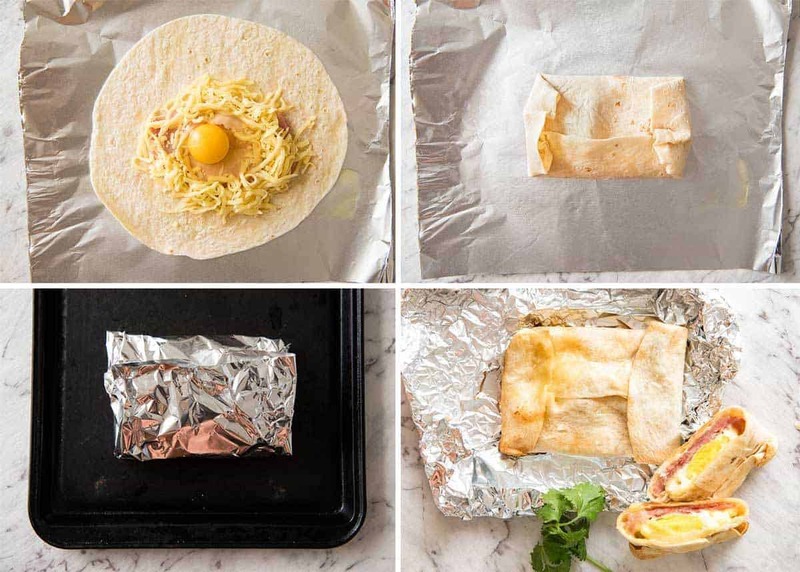 Then simply fold in the sides and wrap into a parcel, and wrap in foil to hold it all together. Then bake until the egg is cooked to your taste – it’s easy to tell, just poke to surface and you’ll be able to feel how firm the egg is. I realise the name is a bit clunky. And if there is anyone reading this who is more of a wordsmith than me, I’d dearly love suggestions for a better name. It sounds almost childish, doesn’t it? And yet somehow, very me. 🙂 (Both the ridiculous sounding name and the recipe itself!). 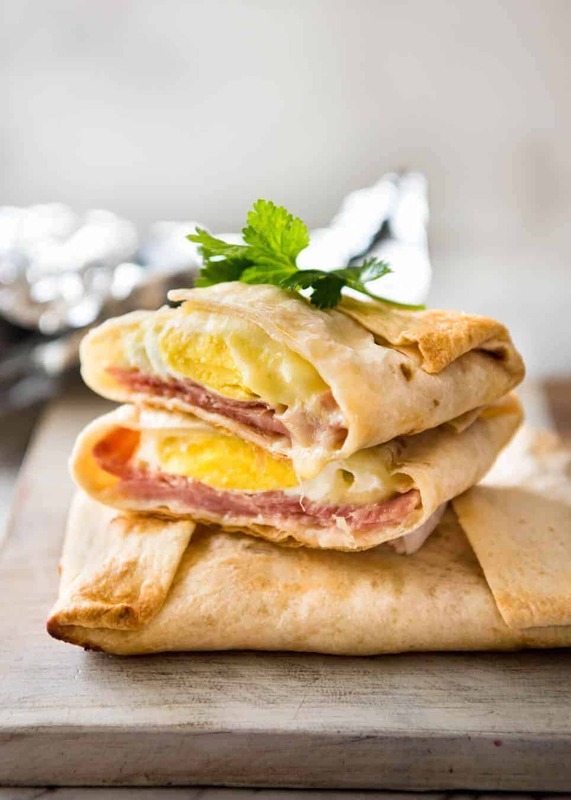 I kept these breakfast pockets very simple, made with just ham, egg and cheese. But think of the possibilities! Add some greens, olives, sun dried tomatoes. Switch out the ham with salami or other cured meat. Cook some bacon. Just use this recipe as the base for your own creations! These Ham, Egg and Cheese breakfast pockets are my 2nd No Washing Up invention. The first was this No Washing Up Ham Egg and Cheese Bread Bowls (SO GOOD!) which I am still very fond it. Those are made with bread rolls, these are made with tortilla wraps or any kind of flatbread that is thin and pliable enough to fold into pockets. And more things stuffed between crispy flatbreads! 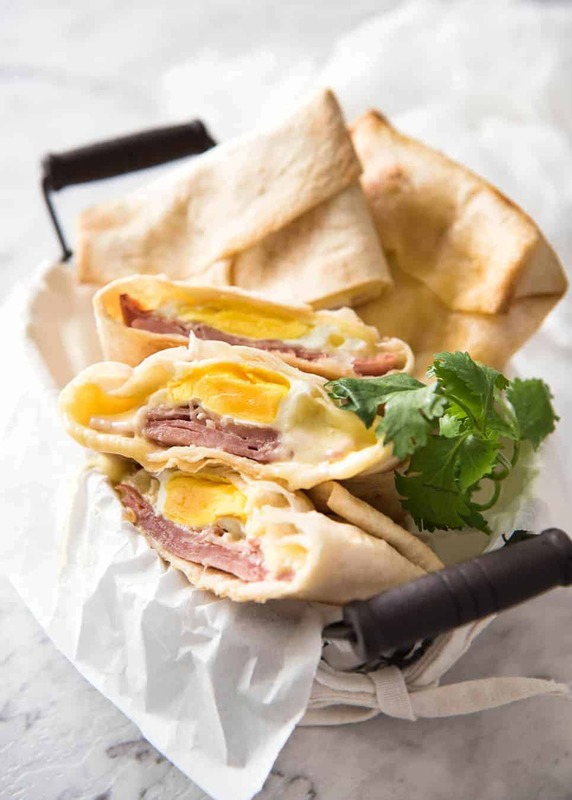 Quesadillas – and try these Avocado Bacon Egg Breakfast Quesadillas! And handy Oven Baked Chicken Quesadillas! 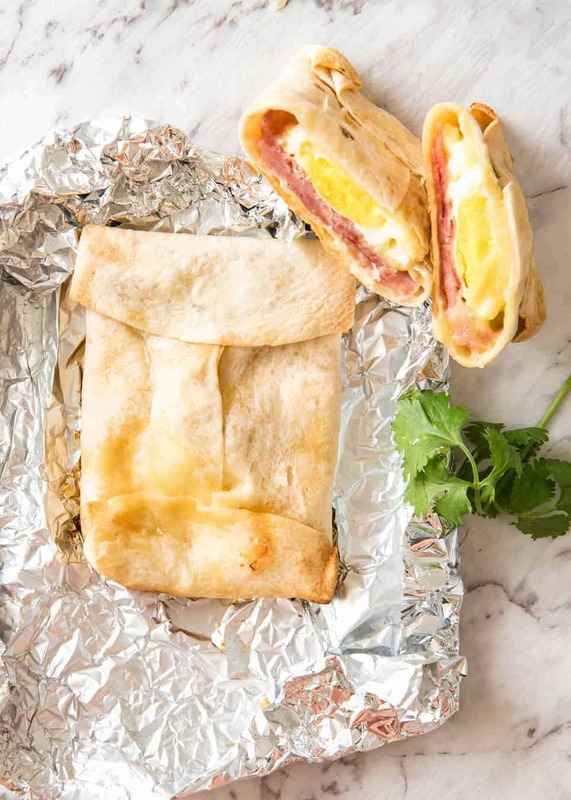 These pockets filled with ham, egg and cheese take 2 minutes to assemble and you won't have a single dirty dish to wash! No need to measure the filling exactly, just eye ball it. Use this recipe as a base and fill these pockets with whatever you want - salami, cooked bacon, spinach, olives - the possibilities are endless! Tip: Don't go overboard with the filling, will make it tricky to wrap. Preheat oven to 180C/350F (all oven types). Place cheese in the middle of the ham, the form into a ring. Bake for 25 minutes. Check to ensure yolk is cooked by poking the pocket, you will feel the dome shape of the yolk. The base and edges should be crispy and the top will be soft. Unwrap immediately (otherwise will sweat and lose crispiness). Serve hot! 1. I use Mission soft wraps and large tortillas. 2. You can use any cheese that melts, like Monterey Jack, Gruyere, even Swiss. I usually don't make this with mozzarella cheese because it doesn't have as much flavour, but can if you want to! 3. I made this with leftover Christmas ham sliced pretty thinly. But you can use any ham you want - or even sub with other cured meat of choice. No Washing Up Ham, Egg and Cheese Pockets recipe video! I cannot believe I have never thought about this! 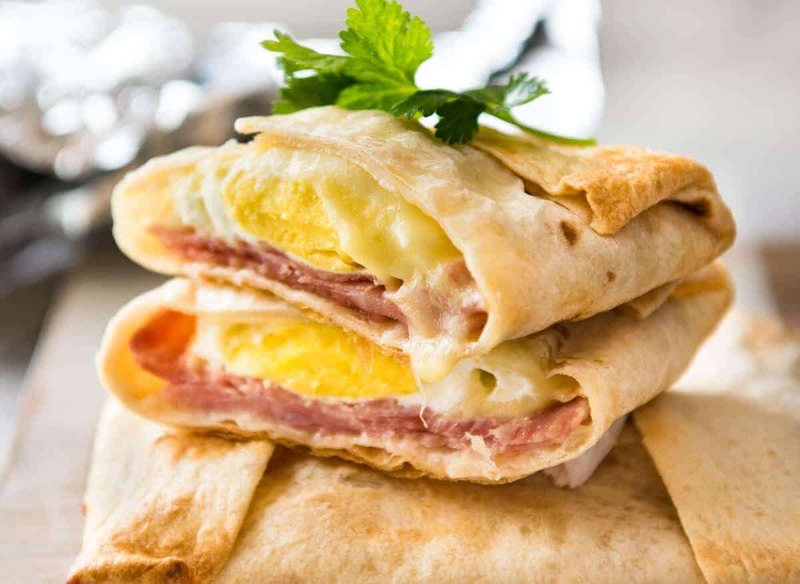 I absolutely love eggs and I absolutely love wraps…it’s a no brainer. Easy and Delicious, especially with all the different options out there! 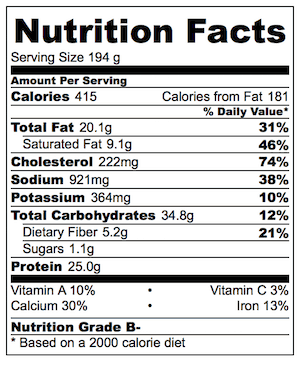 I’m having one of these for breakfast right now. I added baby spinach leaves and roasted red capsicum and cooked it for 20 minutes and the egg was just cooked the way I like it! So yum! Can’t wait to try some different combination of ingredients. Thanks for another great and easy recipe Nagi. So many different possibilities Maria, I’m so glad you enjoyed it Maria! I made it to freeze and tried one. It really was hard to stop then, but I was so curious if they stay this good when reheated. And Yes! Just as good. My few notes: My eggs where to big and I got about 3/4 into one warp. Which is no big deal if you scramble them anyway. I reheated them in the oven and one egg was not completely done. Easy to fix in the microwave, however next time I’ll adjust and cook for 25 minutes the first time. The possibilities are endless, I’m so glad you loved them Simone! I would have wrapped in plastic wrap. Refrigerate until needed than cook them in a dry skillet or comal on medium heat. They would be just as crispy as in the oven but wouldn’t take so long. They were very good. Ours needed longer than 25 minutes. After the longer time, I opened foil and turned on the broiler to brown the tortilla which made it crispier and loved that. 🙌 Such a great idea, and so many possibilities too! I would probablyscramble eggs slightly first. Then add. Salsa in there would be good, too. 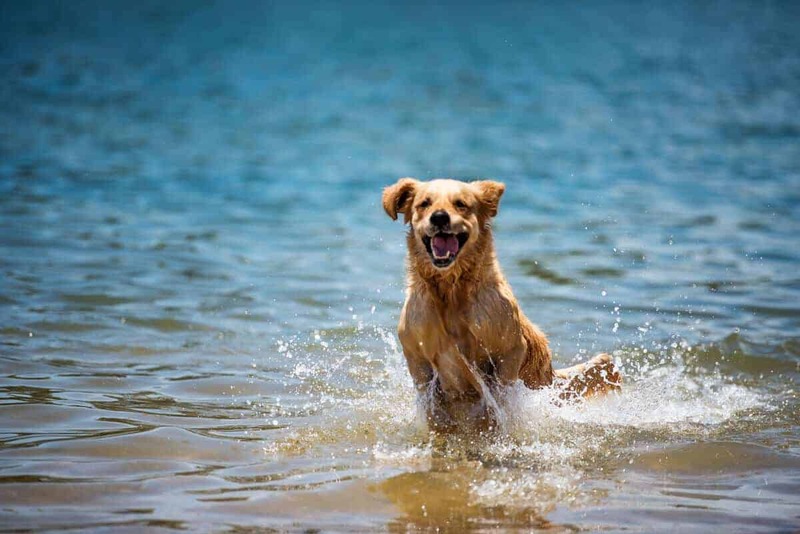 …or on the side. Why not call them Breakfast Pockets? Then you can design different ones. This looks great! How about calling it something like “Bake and Take Breakfast Pocket”? I’m a big fan of breakfast for dinner so I made mine “fancy” 🙂 Spread the tortilla with tomato chutney and chopped some salami over spinach before topping with the egg and cheese….delish!! Looking forward to having them for breakfast too and I think they’ll be the perfect thing to pop in my boy’s lunch for school…endless possibilities! Many thanks for all your delicious, nutritious recipes. Can you scramble rhe eggs instead of leaving them whole. can I bake this in deep fryer? I haven’t tried sorry Nita! Can you prep these the night before? Then bake in the morning?? I just saw the recipe and I am wondering the same thing. I am having familiy over for the holidays and this looks like a great breakfast for a bunch of people if you could prep the night before. Then all you would need to do is pop them in the oven first thing and let the magic of baked goods fill your kitchen. …and Brad nailed the name… Easy Peasy Breakfast Pockets.